By 1969 Walter Godefroot was firmly established as one of the leading riders of his era. That season had opened to a barrage of dominating wins by Eddy Merckx. The Milan-San Remo, Paris-Nice and the Tour of Flanders all fell to the “Cannibal”. It seemed that peloton was totally at his mercy. The situation bred great resentment and discontent amongst the many talented riders of the time, but try as they may few were capable of posing a serious threat to Merckx. While the rest of the world was in awe of the young Merckx, Walter Godefroot saw him simply as a rival to be beaten like anyone else. When the field assembled in the Paris suburb of Chantilly for the 1969 Paris-Roubaix, Merckx was the clear favorite having won the Tour of Flanders just two weeks previously. 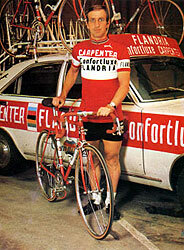 At Flanders he had decimated the field and won by 5'38” from the great Italian champion Felice Gimondi. On the start line was a who's who of the elite pro peloton. World Champion Vitorio Adorni led the Italian challenge along with Felice Gimondi and Michele Dancelli. Jacques Anquetil, Raymond Poulidor and Roger Pingeon led the French contingent. The German sensation Rudi Altig was there in a sea of Belgian faces that included Rik Van Looy, Herman Van Springel, the de Vlaeminck brothers (Roger and Eric), Merckx and of course Walter Godefroot. The weather was the classic raw mixture that the fans relish on Paris-Roubaix day. Rain, hail, snow, and sun came and went as strong winds buffeted the peloton. The vital break occurred at about 80 kms into the race. A strong side wind combined with leg breaking speed had fragmented the field into a series of bordures (echelons). The leading bordure contained most of the favorites and by km 120 a bunch of 38 riders had gained four minutes on the demoralized and beaten bunch. Fifty kilometers later the leading bunch was well into the cobbles of “hell”. The temperature was dropping and warm woolen clothing was passing from team cars to riders. Large drops of chilling rain were soon replaced by hail stones and then huge fluffy snow flakes. Shorts and jerseys were quickly becoming soaked and heavy and the chamois lined shorts were turning into a ‘slimy mess'. While Merckx was being chaperoned by two teammates (Patrick Sercu and Bernard Van de Kerkhove), it was Godefroot who was by far enjoying the most support within the leading bunch with six of his Flandria teammates on hand (including the powerful de Vlaeminck brothers Roger and Eric). Seemingly impervious to the treacherous road conditions and Mother Nature continuing to throw rain, hail, snow and sunny breaks in quick succession, the leaders were now totally focused on the race at hand. Then, as now, the Wallers-Arenberg forest was a favorite place to go on the offensive. Coming at about 189 kms the grim looking bunch rattled their way on to the fabled stones and immediately Godefroot attacked with teammate Roger de Vlaeminck. Merckx quickly responded and bridged up with Eric de Vlaeminck, Schoeters and Huysmans in tow. Over the next few kilometers most of the remaining leaders reconnected in one's and two's. However the brutal accelerations “put paid” to Van Looy's chances for the day. Godefroot and his teammates were now piling on the pressure and at the 200 km mark Godefroot attacked again. This time he opened up a 15 second gap and panic took grip on those behind him. First Felice Gimondi, and then six others, managed to reach Godefroot. The leading seven now included Merckx and Godefroot's two teammates the de Vlaeminck brothers. The next group was already about one minute back, and beaten. Up to this point of the 1969 season Merckx had totally dominated the pro peloton and today all bets were confidently on him. The Flandria team however had their bets elsewhere and now they dictated a hellish pace while the other riders in their lead group were trying to recover from their recent efforts to stay up front. Expecting attacks to come on one of the frequent cobbled sections it was perhaps a big surprise when Godefroot launched his next offensive just as they were leaving a bone jarring section of pave. With his face and limbs caked in grime, Godefroot quickly put fifty meters of space between himself and the remaining six riders. Gasping for air and churning a huge gear, he took tremendous risks slicing corners on the numerous bends. Godefroot's teammates were obviously not assisting in the chase and so it really came down to Merckx and Gimondi who put everything they had into hunting Godefroot down. Godefroot had made his big move with about 28 kms to go. Maintaining an incredible 30mph (48kph) over the alternate cobbles and smooth tarmac sections he soon opened up his fifty meter lead to ten seconds. Eight kilometers later his advantage had grown to 45 seconds. 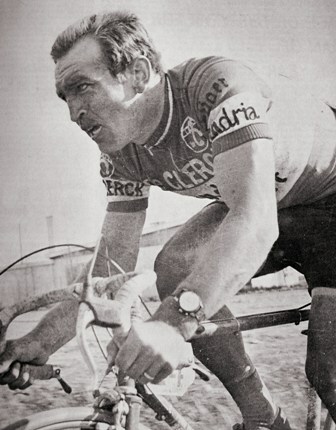 Behind him Merckx and Gimondi were in full fury but totally unable to contain the inspired Godefroot, who was producing an epic Paris-Roubaix ride. The Belgian fans were still confident that Merckx would bridge up. The French fans still had their hopes on Raymond Poulidor who for years had been their best man at this race. But ‘ Pou-Pou ' finally cracked under this latest onslaught from Godefroot and now, totally demoralized, quit the race. 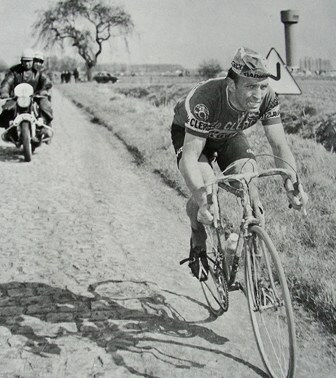 Roubaix was by now only 15 kms away and Godefroot just kept adding to his lead, which had grown to 1'10”. Two days before the race he had carefully inspected the final 70 kms and now, constantly switching from side to side along the narrow roads, he was flashing past little houses, fields and huge crowds, all the while increasing his lead. His massive sprinters legs never faltered as he pounded a huge gear towards the famous Roubaix velodrome. Once onto the track he was greeted with a tumultuous roar. s the victorious Godefroot was drowned by a mob of well wishers, the remnants of the lead group made their way onto the Roubaix track. Just four of them fought for the minor steps on the podium. Merckx took the sprint from Willy Vekemans a full 2‘39” behind Godefroot. Gimondi was fourth and Roger de Vlaeminck fifth. Another 8 minutes passed before the sorry looking remains of what could be described as the main bunch made their final circuits of the Roubaix velodrome. For his part Merckx offered no excuses and stated that he had been beaten by the better man. Godefroot was desperate to prove that he was the equal of the mighty ‘Cannibal' Merckx. On this day in 1969 he proved to be more than equal. And it was no fluke as he demonstrated in other duels with Merckx throughout their illustrious careers.